Algebra, as we know it today, consists of many different ideas, concepts and results. A reasonable estimate of the number of these different items would be somewhere between 50,000 and 200,000. Many of these have been named and many more could (and perhaps should) have a name or a convenient designation. Even the nonspecialist is likely to encounter most of these, either somewhere in the literature, disguised as a definition or a theorem or to hear about them and feel the need for more information. If this happens, one should be able to find enough information in this Handbook to judge if it is worthwhile to pursue the quest. In addition to the primary information given in the Handbook, there are references to relevant articles, books or lecture notes to help the reader. An excellent index has been included which is extensive and not limited to definitions, theorems etc. 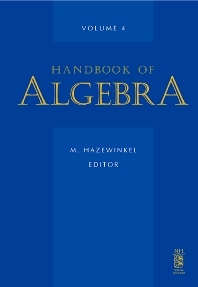 The Handbook of Algebra will publish articles as they are received and thus the reader will find in this third volume articles from twelve different sections. The advantages of this scheme are two-fold: accepted articles will be published quickly and the outline of the Handbook can be allowed to evolve as the various volumes are published. A particularly important function of the Handbook is to provide professional mathematicians working in an area other than their own with sufficient information on the topic in question if and when it is needed. Researchers, students, and professionals working in both pure and applied mathematics.